You’d never know, but just a couple weeks ago, it was freezing in SF. I’m talking 40’s by day and sub-30’s by night! Of course today, it’s mid-60’s and sunshine full-blast. I took to the pavement in a t-shirt and new running shoes trying to work off some holiday el bees. Case and point, I had recently been feeding my hibernation bear belly with Alice Waters’ Beef Stew. It’s the real deal from The Art of Simple Food cookbook — a great primer for anyone who’s interested in learning the basics. 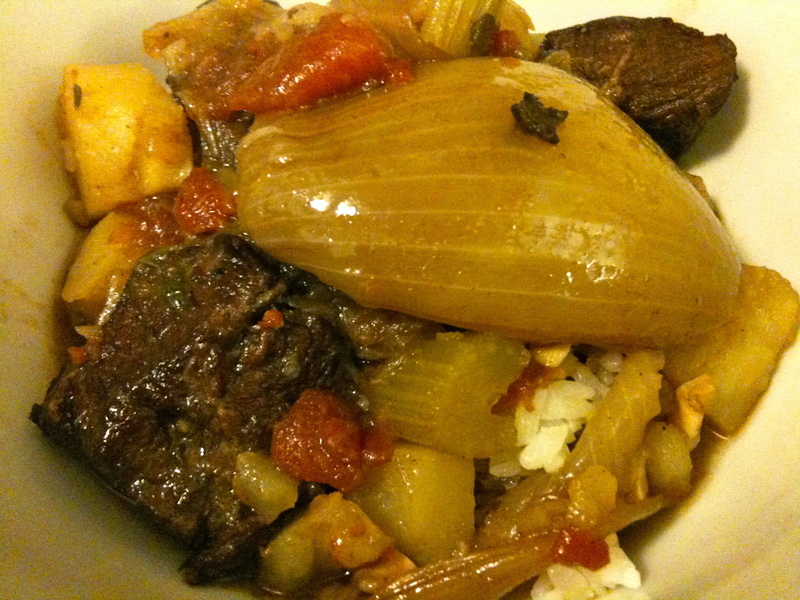 Waters’ recipe for beef stew is really a classic beef bourguignon with a nod to the garden. It’s thick, rich and hearty with satisfying hunks of fork-tender beef and just a hint of vegetables. I loved the flavors of mulling spice imparted by cloves that cleverly are embedded into the onions quarters, plus the zip of orange zest. 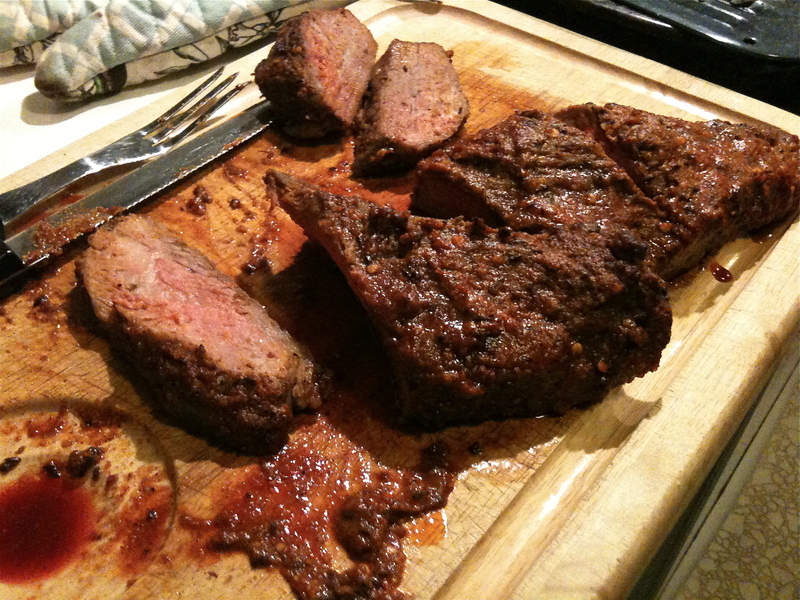 I used a nice cut of marbled flatiron steak aka top blade chuck, which softened up in closer to two hours than three. For wine, I used a Trader Joes fave, a dry Italian red blend of Cabernet Sauvignon, Merlot and Montepulciano, called Tentatre Rosso for ~$7. Is your bear belly grumbling yet? Heat the oil in a heavy skillet and cook bacon until fat is rendered and bacon is lightly browned, but not crisp. Remove bacon. In batches, brown the beef on all sides in the bacon fat. Put meat into a heavy pot or braising dish. Lower heat and pour off most of the fat from the skillet. Cook the carrots, celery, and onions with the herbs, bay leaf, and peppercorns until lightly browned. Add to the beef in pot/dish. Raise heat of empty skillet and add the brandy, then the red wine. Scrape up the browned bits stuck to the bottom of the pot and reduce wine by two-thirds. Pour over the beef and vegetables in the pot. Add the tomatoes, garlic, orange zest, and broth to the pot. The liquid should come up at least 3/4 of the way up to the top of the beef/vegetables; add more broth if needed. It does not need to cover the ingredients entirely. Cover and cook at a bare simmer on the stovetop, or in a 325-degree oven for 2-3 hours until meat falls apart when tested with a fork. Add potatoes 30 minutes before done. Check the stew occasionally to make sure it’s not boiling and there is enough liquid. Let stew rest for a few minutes before serving and skim off layer of fat on top. Season to taste with salt and serve over rice, egg noodles, or with crusty bread. Serves 6.